Rovers next trip is to take on The Cumbrians at Brunton Park. Carlisle have been improving this season after a rather sluggish start which saw two losses and a draw from their first three games. They did turn the corner after their excellent away win against Cheltenham with Richie Bennett getting the only goal of the game. Their form has been excellent since, winning five of their last six games. Carlisle will be coming off the back of a 2-1 victory against Cambridge and will want to continue their good form on home soil. Rovers will of course be looking to crash the party. Will MM stick with the same XI that struggled at times against Colchester? In answer to the last question – I regret not. I honestly don’t think Cole Stockton is up to it. Don’t expect him to be prolific, but he doesn’t bully the opposition, provide too many chances for Nors or hold the ball up that well. In essence I don’t think Norwood would miss him – so maybe best to play a more flexible system. Credit where it is due he does try his best, but maybe best as a squad player. I know it looks like we’re over reliant on Nors’ goals but is that because MM has found a system that works with Stockton? If we did ever revert to a 532 is DMH best suited to this as per last season? With Zoum on the left & then move Connor square alongside Tolls/Larnell/Smith behind the Lord? News that we have signed Ryan William on loan may influence Mickey’s outlook for formation and selection. I don’t think Ryan Williams is a loan, but a free agent. Can only presume the short term deal is the player’s wishes or that MM is looking to loan out Ben Tollitt for a spell. 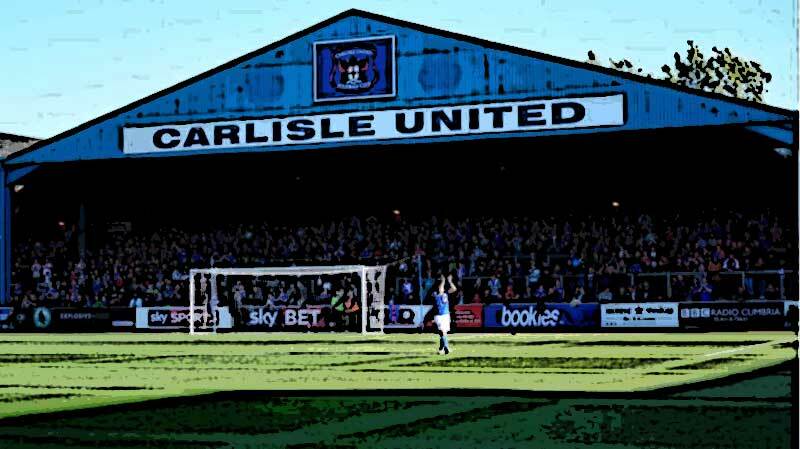 On paper this is our toughest game so far, with Carlisle riding high and unbeaten at home. They were tipped to struggle by many people in pre-season and their squad does not look that great, although names like Anthony Gerrard and Kelvin Etuhu stand out. Ex-Rover Mike Jones is also at Brunton Park, although I don’t think he has been starting recently. I expect Micky will go with the same formation and starting eleven as last week. Despite the repeated calls for Stockton to be dropped, I thought it was noticeable against Colchester that we could not hold the ball up front when Cole was substituted and I don’t think Mullin is a natural foil for Norwood. From MM’s interview it does not sound like Williams will make the bench. Prediction: score draw or narrow defeat, with 6-700 SWA in attendance. Carlisle fans themselves were very downbeat about their prospects pre-season, but have started the season well and this will be a challenging game. Arguably Banks and McNulty were the most below par v Colchester, but as our best players to date, you could hardly drop them. I agree that we’re likely to start unchanged. Perhaps Stockton could follow up a much improved showing last week, with a goal against a former club, where he didn’t fare well. Mullin and Norwood can function together effectively as the Port Vale game showed, but don’t think Paul did himself any favours during his twenty minutes on the pitch last Saturday. I’m unsure about starting Mullin and Norwood together. I know it’s not been tested much but they just seem too similar. I think with Stockton it’s a case of ‘better the devil you know’ because for all his faults, he is the only player up front who will hold up the ball and link others into play. I have this image of Mullin and Norwood constantly chasing balls with no-one up there effectively holding up the ball. This is where we miss Cook badly. he could hold up the ball and score a fair few too! While I think Norwood + Stockton is the best attacking combination we’ve got, haven’t seen much evidence of Mullin and Norwood getting in each other’s way in their limited time together on the pitch. Norwood created a chance for Jennings on Saturday and as someone who’s played as a lone striker, is able to hold the ball up. Agree a target-man forward would give the attack an added dimension. Holding the ball up is hardly Norwood’s strength though. He is always looking to run in behind and his natural game is the complete opposite of Stockton’s, which is why they complement each other. I think there is a difference between making an impact as a front pairing late in a game when you are pushing for a victory (Port Vale) and maintaining a pattern of play over ninety-odd minutes. I agree with Ian that if Nors and Mullin play together, I don’t see who is going to come short for the ball. All of that said, I would not mind seeing them given a go at some point ! If i was mullin i would be working as hard as i could and would be proving a point to the manager that i want to play . We pAid money and we dont have lots of that so he has to get a chance!!!!!!!!! If by January, Norwood hasn’t signed a new deal, the club will need to make a decision on selling or risking his contract running down. This means Mullin will need to get sufficient game time to make an assessment of whether he can fill the gap, link up with Stockton etc. I’ve seen so little of Paul in action that not enough to form an opinion. Always felt that in our NL days we should have tried Cook with Stockton, who, despite being similar stature, had totally different playing styles. I think Mullin and Norwood are probably a closer match in their approach. Not sure about playing Cook and Stockton together Boz. Would have been the slowest front two in the division! We already have the heaviest back 2 in the division when Big Mac and Monthe are a pair! DMH replaces Smith, Buxton on the bench. Harris not in squad. It will be interesting to see how DMH plays from the start. Can only assume Smith’s lack of stamina has seen DMH get the nod ahead of him. Feel Gilmour a little lightweight and would rather Harris on the bench tbh. For the sake of the club it would have to be sell and lump the money straightaway on a replacement. Which brings us back to Rowe!! Am I missing something or do we never hear of “release clauses” at our level? Get him signed up and if someone wants to offer decent money he can listen to them and we can give him a nice slice of the pie if he wants to go? Back to the game, only following on Twitter but it looks like we’re riding our luck? A decent half. For the first twenty five minutes were much the better side but Carlisle have come into it since then. Better performances across the pitch than last week, particularly in midfield, just hope we don’t fade in the second half. And he hits the bar he has to start now surly he has to . Well what a great result that is against be in form cumbrians. Will await any reports but pleased Mullin has got off the mark. Will he start ahead of Stockton now? Surely he deserves a chance. We deserved that for the second half performance. The penalty was a turning point but Micky also deserves credit for the substitutions. He could have settled for nil nil but he went for it. Mullin was excellent and scored a pearler and will start next week. Cole did not do enough I am afraid. A hard fought win, by all accounts. Although statistically it was the most convincing, it could have gone either way. In fact, I think every game so far has had its turning point. Fortunately we are proving a really difficult team to beat even if we are still finding scoring goals difficult. Another tight game but we fully deserved the victory. Up until the penalty incident I thought we had more of the play and Carlisle had the better of the chances, although most of them were not clear cut. However, Scott’s save and Micky’s substitutions gave us a massive lift and we were rampant in the last fifteen minutes. As so often this season we started the game really brightly, and were well on top for twenty five minutes, testing their keeper with a few decent efforts from range. There was then our equally customary lull, and we rode our luck on a couple of occasions, with one looping header dropping on to our crossbar, albeit Scott had very little to do overall. However, in the second half I thought we were well in control even prior to the penalty and a one-nil defeat would have been very harsh on us. Carlisle played some tidy football at times but did not look any better than us, and today’s game just reinforced my view that there is very little difference in ability between most teams at this level, with the possible exception of the top two or three (Lincoln, MK, Exeter). Individually, I thought all of the back four were excellent, particularly McNulty and Zoum. Caprice had an ok game but produced an absolutely delicious cross for the opening goal, which was undefendable: one of our forwards would have tapped it in if the defender had not sliced it into his own net. Monthesaurus was solid again, but was over-confident on a couple of occasions, playing in the wrong areas. The midfield duo were much better than last week, but I was more impressed by McCullough than Banks today. He does the simple things really well, keeping the ball moving with ten yard passes and making interceptions in front of the back four which often go unnoticed. Jennings worked hard defensively but, again, did not offer that much going forward. DMH was ok, making a couple of good runs and putting in some decent crosses, but does not offer anywhere near as much as Smith at this level. I would guess Johnny was dropped to encourage him to up his game after a couple of below par displays. The substitutions made a huge difference. Smith gave us more quality on the right hand side and the Carlisle defence could not deal with him, and Mullin offered twice the energy of Stockton. I thought Cole started the game brightly, similar to last week, and forced a good save from their keeper with a shot from distance. However, he then faded and there were a number of occasions in the second half when we got into good areas and I thought with more conviction he could have made something happen. I am not his biggest critic, but he always seems to offer 6 out of 10 performances, and is not proactive enough. Mullin by contrast was a constant nuisance to their back four and took his goal really well. There was another brilliant Rovers following of 800 who sang throughout and played a big part in the victory in my view. The last quarter of an hour was as good as it gets watching Rovers away from home. Man of the match, Steve McNulty. As each game comes along you think “this is a real yardstick”. What a great first eight games. Without Kung Fu Jay it would be pretty much perfect! Pleased for Mullin. Even if Stockton starts next game he knows he can do the biz. Pretty much what the great Jimmy Harvey and our current manager did ! Not too long ago my heart sank when Lincoln scored a last minute winner. [QUOTE=”Rockfords Love Child, post: 49508, member: 292″]Holding the ball up is hardly Norwood’s strength though. He is always looking to run in behind and his natural game is the complete opposite of Stockton’s, which is why they complement each other. Given your observations about Stockton after today’s game, have you adapted your view on Norwood and Mullin starting together? It sounds like a very encouraging performance, thanks for the reports. [QUOTE=”Boz, post: 49528, member: 19″]Given your observations about Stockton after today’s game, have you adapted your view on Norwood and Mullin starting together? Not really, in as much as I don’t think they are a natural pairing and I can see why Mellon has gone with Stockton. But if one forward (Mullin) is clearly outperforming another (Stockton) then he deserves to play. I think Mullin has played well in three of his four games, and even against Colchester last week he was in the right place for a better chance than Stockton had all game. He is showing the better attitude of the two. As much as I like Mellon and he gets some daft post match questions sometimes, his attitude in the ifollow interview is pretty bad I have to say. Suspect some of the interviewers are young lads (apart from Neil turner), and he’s a bit harsh on them. Especially at the end saying they are looking for negatives all the time. I disagree Sparky. I think Mellon was spot on with his comments, and he is entitled to respond if he thinks he is receiving unjust criticism. Richard Garnett, who is usually ok, criticised the passing, claiming that we kept giving the ball away. I found that utterly bizarre to be honest. Mellon responded by saying that we were a bit ragged for the last twenty minutes of the first half, but good for the rest of the game, which is exactly how I saw it. We were much better today than the previous two games. Seen brief highlights. Great cross from Caprice for the og and quality finish by Mullin. Penalty didn’t seem to be as nailed on as had thought from the match reports. I did not think it was a penalty at the time. Great result. Really pleased Mullin got on the scoresheet and what a goal too! It’s been a superb start to the season. [QUOTE=”Rockfords Love Child, post: 49531, member: 292″]I disagree Sparky. I think Mellon was spot on with his comments, and he is entitled to respond if he thinks he is receiving unjust criticism. Well I am not so sure it was that bizarre. I wasn’t there but I listened live on I Follow and the commentators were very negative about our performance in the first half describing exactly what the interviewer described which was poor passing, unable to keep the ball, lack of quality etc. Having now watched the highlights we looked good going forward but defensively we weren’t great. MM seemed to think we were very good which I think is perhaps a bit optimistic. All that said was a very good result! Mullin does have to start. He has more energy and drive than the lumbering Stockton. Having watched the entire ninety five minutes, I can only say there was nothing wrong with our passing, other than in the period Mellon highlighted himself. I am not sure I would trust the judgement of the Ifollow commentators (still the volunteers I think ?) above Mellon’s. Either way, it was a strange line of questioning from a journalist when we had just won away from home, at a team in form, with the manager’s substitutions playing a key part in the victory. By all means highlight the disappointing aspects of the performance, but would not it have been better to start the interview with a couple of positive comments first, given the context ? What an enjoyable away day that was! From the brink of 0-1 down to 1-0 up in the blink of an eye. Really dramatic game and fantastic support from the SWA. They don’t come much better than that! The substitutions made a massive difference with game changing energy injected by Smith and Mullin. If either of them don’t start next week they will have every right to be pretty pi**ed off but I’m sure they both will. Micky very pleased with Mullin, well play him then! I was looking at the Carlile pen. What a joke decision. A 50/50 ball with the forward running at pace. Justice was served!